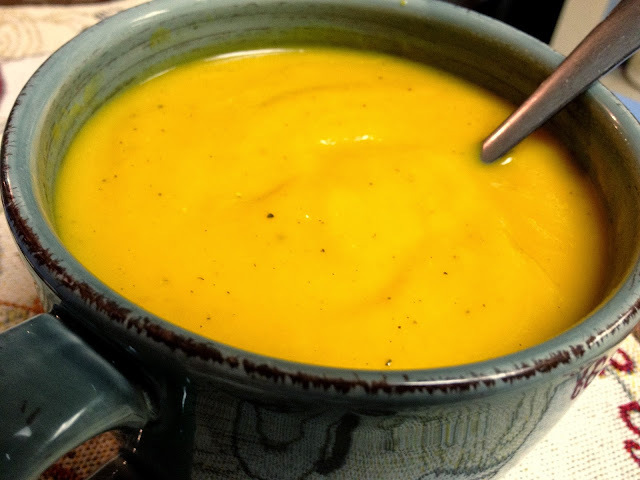 One of my absolute favorite fall food items is the butternut squash. I was only introduced to it a couple of years ago and it changed my world forever! It's creamy texture and delicate, nutty flavor incorporate well into a variety of dishes, but it especially lends itself well to soups. 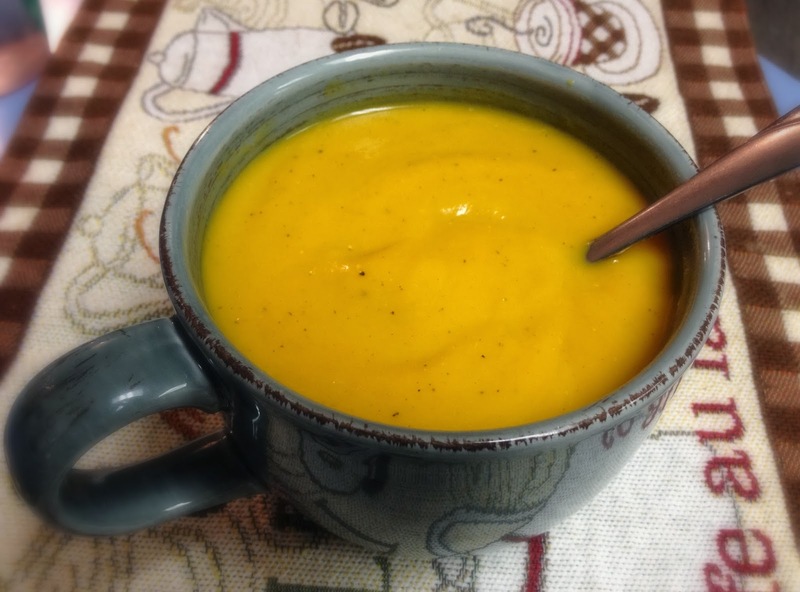 Its bright color is cheery, and pureed into a dreamy smoothness, it banishes the chill of a crisp fall evening in no time! This recipe makes a huge batch-we had some for dinner, froze enough for another dinner, and had enough leftover for several lunches! Pro tip: to make your squash easier to cut (these things are notorious for being difficult to get into! ), microwave it for 2-3 min. The rind should be somewhat softened so you can slice it in half without cutting off your hand in the process. Also, before freezing, be sure to let the soup cool completely! In a skillet, cook onion in butter over medium heat, stirring occasionally, until tender but not browned. Add the garlic and cook 1-2 min. more. Spoon into slow cooker. Add squash, sweet potatoes, broth and seasonings. Cover and cook on high 4 hours or on low 6-7 hours. Let cool slightly, then puree in a blender or using an immersion blender (stick blender) until smooth. Stir in cream. I hope you enjoy it!! I think it is a delicious combination! Making this right now! Accidentally put in the cream w/ the squash.... yikes. Hope I didn't ruin the whole thing! Clearly, got too excited. Great! It should be fine. The only thing that might happen is the cream might curdle. :) Let me know how it turns out!